Elizabeth Scarlett Jagger (born March 2, 1984 in New York City) is an English model and actress. 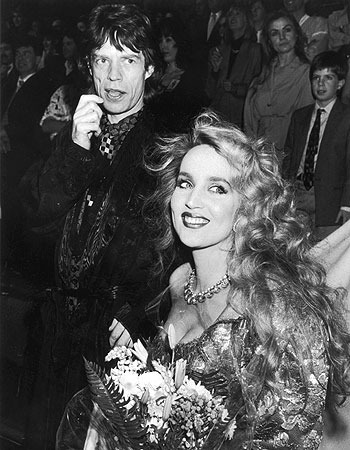 She is the daughter of Mick Jagger and his erstwhile common-law wife Jerry Hall. Her siblings are James, Georgia, and Gabriel, and her half-siblings are Karis Jagger, Jade Jagger, and Lucas Morad-Jagger. Elizabeth "Lizzy" Scarlett Jagger (born March 2, 1984 in New York City) is an English-American model and actress. She is the oldest daughter of Mick Jagger and Jerry Hall. Lizzy’s first appearance on the fashion runway was in 1998, when she modelled for Thierry Mugler alongside her mother. She appeared in a campaign for Tommy Hilfiger at the turn of the century, alongside Alexandra and Theodora Richards, daughters of the Rolling Stones' Keith Richards. In 2001 she appeared in the documentary Being Mick as herself. Jagger was signed as the face of Lancôme's LCM range of cosmetics in September 2002. She appeared in the film Igby Goes Down. She starred alongside Twiggy, Noemie Lenoir, Erin O'Connor and Laura Bailey in the most recent Marks and Spencer advert. She is signed to Independent Models in London, and Beatrice Model agency in Milan.